The entire world has transformed into a digital world. The medium of running businesses is changing with the time. In the recent years, a substantial growth has been seen in the online modes of business. The eCommerce has brought enormous changes in the traditional business system. E-Commerce is related to online business activities in which people buy goods through an online mode and the business owner holds the responsibility of delivering goods. The online stores play a vital role in this system. There are a number of online stores are working over the internet and established their strong credibility among the people. According to Statista.com, the b2c eCommerce generated the 325.4 billion US dollar revenue in 2013 for the European market. It is likely to reach at 534.9 Billion US dollars in the year 2018. These online stores have been developed with the help of robust system which we call the eCommerce platforms. When we look into the recent years, we found that several startups have grown in this period and now successfully running their online business. It became possible by the best eCommerce platforms for startups. Some of the best eCommerce platforms for startups allow the business owner to create a vibrant buying experience for their potential customers. These online stores need of proper maintenance for offering goods, routine transactions, delivery of goods and other associated processes. The mobile commerce is another aspect of online business, so an eCommerce website must have a feature to customize it according to the mobile users. As the smartphone users are growing with a high speed, these eCommerce platforms offer the best environment for the growth of eCommerce industry. We have compiled a list of best eCommerce platforms for startups that would help you to choose a right eCommerce platform for your business. Magento is the market leader in the industry, following by other eCommerce platforms such as Shopify, Prestashop, WordPress, and many others. There is a huge number of online retail portals have been developed in the Magento. Many highly recognized brands use the Magento due to its power and effectiveness. 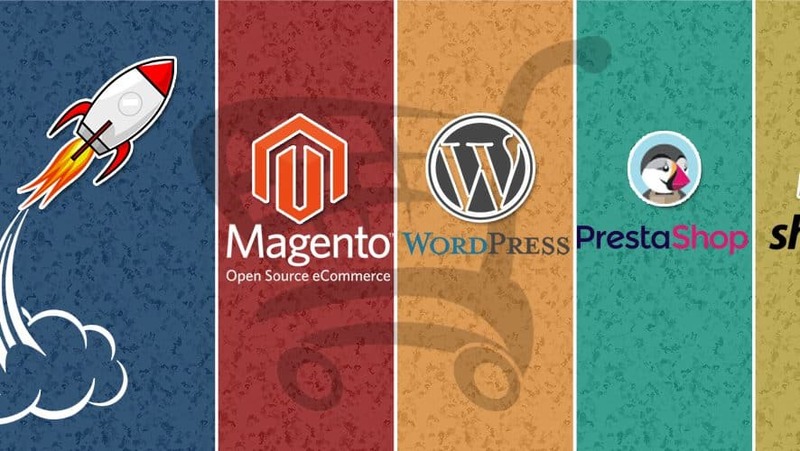 Magento is an open source platform that is the secret of its popularity than the other eCommerce platforms. However, Magento developer requires a good knowledge of CSS, JS, and HTML to develop a robust solution for any online business. An expert developer with extensive knowledge of Magento can develop a full-furnished online solution for you. It is an easily customizable system. Whether you are adding a product or making changes in the look of the website, you can easily navigate through the each of the components. Along with it, you get the best support of its large community. If you ever get stuck with anything, you can share your problem in the community. The costing of this eCommerce platform completely relies on the themes you are using to develop an online business system. You should consider this thing while you choose a theme for development. WordPress is the popular content management system. It was made for the blogging intent, but due to its robustness, it became one of the best eCommerce platforms for online business needs. WordPress offers a variety of themes that are customizable with easy efforts. There is a huge list of plugins that makes everything easy to manage. Several successful online portals recommend having their new products to be launched on the WordPress as it is a one-stop solution. Woo-commerce is a free plugin for WordPress platform that assist in establishing in the online payment system, organizing the product, and styling the online portals. Shopping cart management has become very easy with WordPress plugins. You get a huge list of plugins in WordPress development platform. By using them, you could make any changes in the websites without touching the coding part. Whatever changes you want to introduce in your online portal, you get lots of plugins for each task. Prestashop is an ideal eCommerce solution for startups and small business ventures having limited resources. You needn’t be a technocrat to manage your online store built within Prestashop. It is open source software to build the online store. If you are looking for a budget solution for your online store, then Prestashop is the best choice for you. Prestashop is SEO friendly platforms that allow you to gain traffic from search engines. It has the inbuilt feature through which you can easily monitor your website traffic. Prestashop is a budget solution, it does not mean that you do not get the rich functionality with it to build a customized solution for you. It contains most of the required functionality to build a profitable online store. Here you come to know about the best eCommerce platforms for startups to start an online business. The startups may prefer one most suitable platform from the above choices. When you have a limited budget and want to develop an online portal with high functionality, these platforms are best for you.